The Many Mini-Adventures of the Wards: Cake? We don't need no stinking CAKE! Cake? We don't need no stinking CAKE! Logan is our no-sweets man. He does not like anything sweet. No sugar. No candy. No soda. No cookies, cake, pie, ice cream or anything resembling dessert whatsoever. Not even fruits and some veggies that naturally have a lot of sugar. What do we do when it's time for birthday cake, you ask? Well.... we improvise! Logan had many birthday celebrations this weekend. And needed a "cake" for each event. Here are our perfect improvisations - perfect because they are all foods that Logan LOVES! Cake #4 - French Fry Cake! Logan likes having a unique cake unlike anyone else he knows. He also likes being able to actually EAT his own "birthday cake". 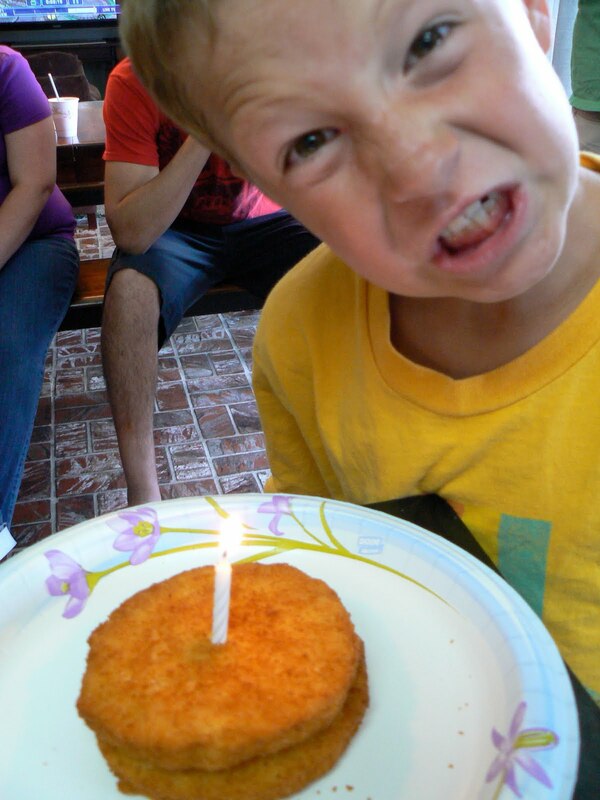 Finally we have figured out how to make this birthday boy happy on his special day! What a very clever idea! Glad he enjoyed his special day. The Dodgers WIN THE CHAMPIONSHIP!! !